The LightningAir is not a filter. Instead it re-creates the same process that Mother Nature uses to keep the air fresh. It generates the negative ions that nature uses to significantly reduce the amount of dust and other particles in the air. 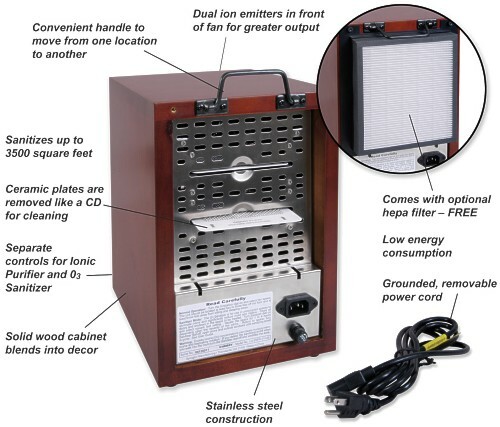 It also produces activated oxygen to significantly reduce odors without the use of fragrances. It helps to break down mold, mildew and other pollutants at their source. Now with added HEPA filtration! Areas up to 3,500 sq. ft. Compare to some filtration systems that use over $1.00 per day for only one room. � Kiln Dried as used for "Baby Grand Piano"
� 80% of air cleaning depends on efficient ionization process. � Greatly increased negative ion output. � Maintains continuous needlepoint integrity for a life time of ---ion expulsion. � Causes particulate to fall out of breathing space faster and more effectively. � A polarizing of positive and negative ions for a natural outdoor energizing effect. � Electronically produces Natural Activated Oxygen. � Heavy duty ceramic and stainless steel mesh construction. � New easy slide in/slide out plate system. � Resists oxidizing of internal materials. � Maximum Activated Oxygen and Ion disbursement. � 6 blade Turbo fan design for ultimate air turbulent airflow distribution. � Maximum horizontal and vertical air flow. � Compare to some filtration systems that use over $1.00 per day for one room. Ozone output: Cold Plasma Dialectic Plate generation. Results pending. Accurate Testing for ozone output varies dramatically with level of humidity, temperature and distance. The ozone output is regulated by a manual variable setting. Up to 3500 sq. ft. 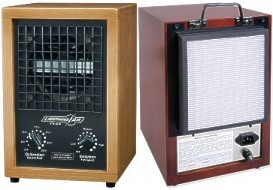 The LA2 uses 2 filter plates included with purchase. *Depends on variables such as humidity, placement, amount of pollution and temperature.